Burial was a death metal band from Sarasota, Florida, that was formed by bass player Mike Fiscina and vocalist / guitarist Mike Callahan. They reportedly recorded a demo and a 7" EP before breaking up. Mike Callahan later joined a rap act and Fiscina went on tour with Disincarnate. There are several other bands who have gone by the name Burial. PAGE STATUS: Complete, but did they do another demo? 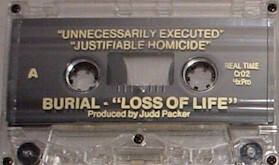 Pro made cassettes, but Xeroxed four panel covers.